Copper Mountain Technologies has unveiled their new vector network analyzer frequency extender system. The FET1854 extenders can be used to extend the frequency of CMT's Sub-9 GHz VNAs to operate at 18 to 54 GHz. This product is an addition to the existing CobaltFx mmWave frequency extension system already used by many telecommunications and consumer electronics companies. With the launch of the new FET1854 extenders, the CobaltFx system will allow engineers to build a scalable and affordable 5G testing solution. Anchored by a 2- or 4-port 9 or 20 GHz USB vector network analyzer, CobaltFx includes extenders in multiple frequency bands: 18 to 54 GHz, 50 to 75 GHz, 60 to 90 GHz, and 75 to 110 GHz. Frequency extension is a standard software feature. 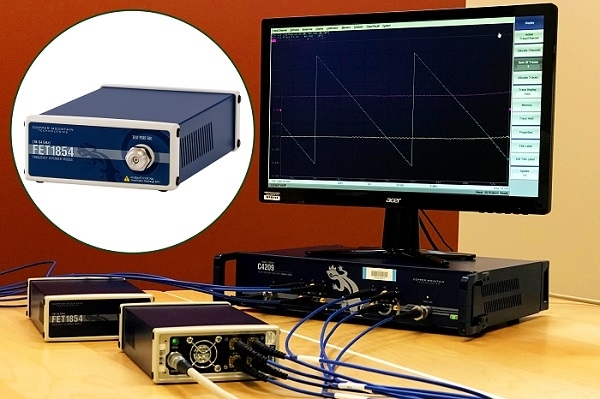 Copper Mountain Technologies’ VNAs include an RF measurement module and a software application which runs on a Windows PC, laptop or tablet, connecting to the measurement hardware via USB interface. The user can take advantage of the latest OS, processing power, larger display, and reliable performance of an external PC, as well as lower total cost of ownership and simplified maintenance of the analyzer. The result is a faster, more effective test process that fits into the modern workspace in lab, production, field and secure testing environments. Click here to learn more about this frequency extender.